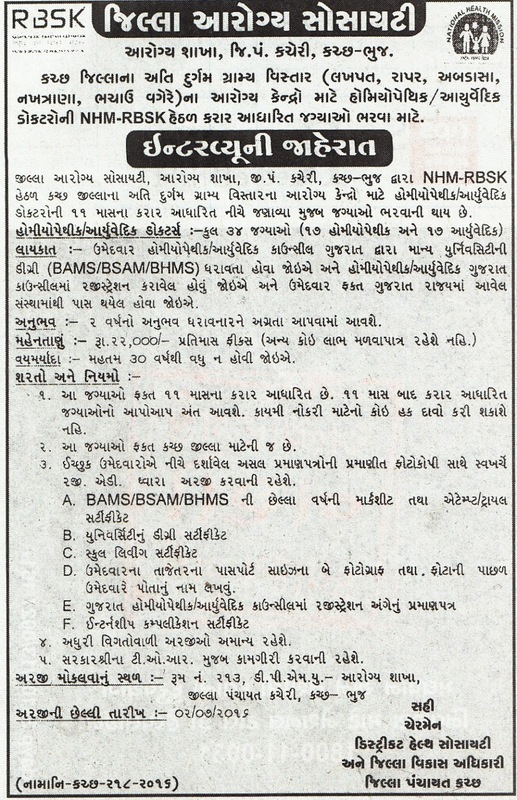 District Health Society, Kutch has published a Advertisement for below mentioned Posts 2016. Other details like age limit, educational qualification, selection process, application fee and how to apply are given below. Educational Qualification : BAMS/BSAM/BHMS Degree from recognized university, Having Registration from Gujarat Homeopathic / Ayurvedic Council. Age Limit : Max. 30 years. Address to sent Applications : Room No. 213, D.P.M.U. - Health Department, District Panchayat Office, Kutch - Bhuj.